When you click the Tasks tab from within a property, you will see all of that property's tasks, with Incomplete Tasks grouped together near the top of the screen, followed by Completed Tasks below. Incomplete tasks can be prioritized, deleted, "owned", or marked complete. Completed tasks cannot be modified in any way, and remain attached to the property for historical purposes. Tasks are divided by type; you can select the Property, Offer, or Preservation tabs at the top of the screen to view each respective list of tasks. A red bar indicates the task is overdue. A yellow bar indicates the task is due TODAY. A green bar indicates the task is due sometime in the future. For a detailed explanation of the columns and icons displayed on the Tasks screen, clickhere. You can also view incomplete tasks from the Home tab (Tasks sub tab). 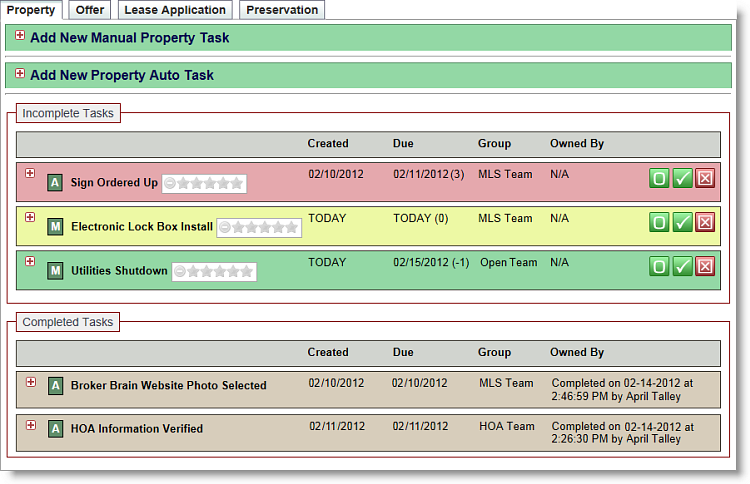 However, the Home tab displays ALL tasks in Broker Brain, while viewing them here shows tasks for this property only.